DA’s Office role is in prosecuting an elder abuse perpetrator at the John Duke Senior Center. 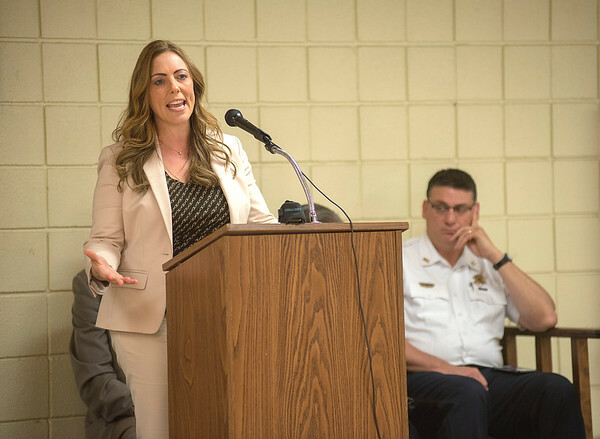 She and other county and state leaders, including Sheriff James Voutour, right, held a program for seniors to fight against elder abuse and senior scams. The OFA will screen the documentary “Fleeced” at Thursday, and is inviting members of the Western New York press corps to attend, so they can learn more about an underreported topic that has become more prevalent in recent years, as retired Baby Boomers head into their golden years: scams, financial products and even caretaker and family deceptions that aim to part seniors from a lifetime of savings. Thursday’s film screening follows a press conference that will feature DiCarlo, Wojtaszek, Voutour, County Legislator David E. Godfrey, R-Wilson, Commissioner of Social Services Anthony Restaino, Mayor Paul A. Dyster, D-Niagara Falls, a representative of Sen. Robert G. Ortt, R-North Tonawanda, and a social worker from the Center for Elder Law and Justice. WHAT: Discussing strategies for fighting elder abuse, including elder financial abuse; screening “Fleeced”; offering media availability to discuss full array of senior programs and steps. **Resource tables will be available to the participants so if there is any information you would like to share, please bring it to the event.